I’ve seen a couple of great movies in the last few months, and at least twice, I saw the trailer for the new movie The Miracle Season, starring Oscar winner Helen Hunt. I thought the movie looked great (though not a rabid sports fan, I am a HUGE SUCKER for an inspiring sports story! ), and I noticed that the Miracle Season trailer said it was rated PG. As a mom of three kids who LOVE movies, I’ve always got my eye open for a family-friendly one, so the PG rating piqued my interest as well. 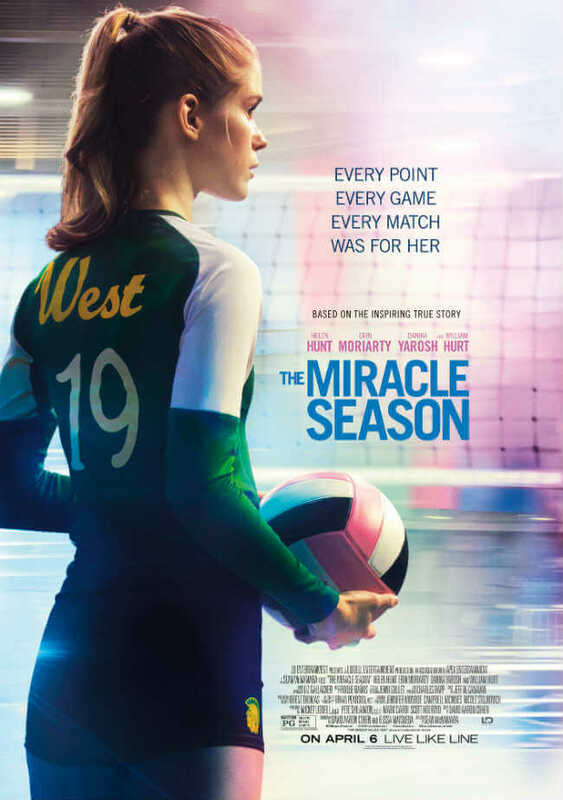 The Miracle Season is the story of the 2011 West High Girls volleyball team from Iowa City, Iowa. Coming off winning the state championship the year before, the girls were set to have fantastic season yet again — until their team captain and star player, Caroline Found was killed in an accident just days before starting her senior year. Tragically, her mother Ellyn Found dies just days later of pancreatic cancer. The tight-knit community is devastated, and in the wake of tragedy, the reigning champions of West High volleyball falter, losing game after game as they start their season without Caroline. Fortunately for the devastated and discouraged players, they have a tough-love coach in Kathy “Bres” Bresnahan, played by Helen Hunt. Though hurting herself, Bres inspires her players, re-training them to learn new skills to compensate for Caroline’s absence on the court, and urging them to play, live, and win like “Line,” Caroline’s nickname. The movie also prominently features Caroline’s dad, Dr. Ernie Found, who lost not just his daughter but his wife in the space of two weeks. Caroline’s friends and teammates want to win as much for him as they do for Line. He remains close to his daughter’s teammates and encourages them even as he grieves; his influence is touching. In real life, Ernie Found is a man of deep faith, and his relationship and trust in God is unshakable. In spite of his loss and grief, Ernie Found’s prayer to God was one of thanksgiving – he thanked God for being blessed and for the wonderful years he had with Caroline. His strength and faith through grief, seen here in this featurette, are truly touching. Parents, this is a great movie for the whole family. If you’re wondering if it’s safe to take your kids to, the answer is YES: even my 7-year-old was really into it once the team started winning (LOL!) and there was nothing in it I wouldn’t want him to see. Moreover, my 11-year-old daughter was mega-inspired by these teenage girls who were working hard and getting it DONE even though they were grieving. The only caution is if you’ve had someone in your family recently die in an accident or pass away from cancer, it might be a trigger for your child, but if not, then it’s a movie I would encourage your family to see. The community’s motto “LIVE LIKE LINE” encouraged others to show the same character and kindness that Caroline did in her life – on and off the court. My only complaint about the movie is that, because there were so many characters, there wasn’t as much character development as I would have liked. Helen Hunt is an amazing actress and that wasn’t really showcased to her full potential, but that’s not something that necessarily takes away from the movie, it’s just something that could have been added to make it even better. Bottom line: if you like going to the movies, and you like taking your kids to movies, this is a great one to go see. ESPECIALLY if you have a sports fan in your house! 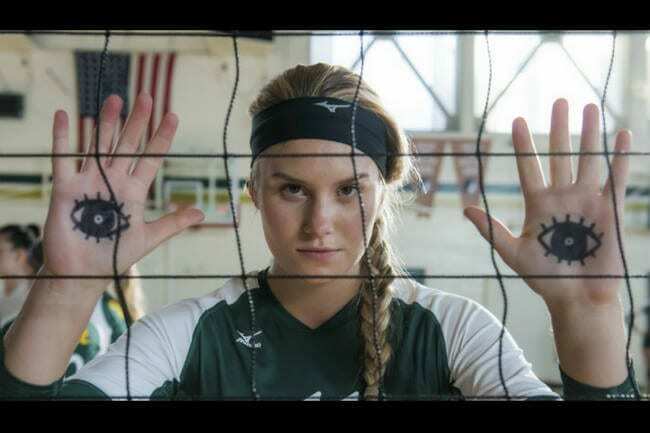 To get even more excited for the movie, check out this special that HBO Sports did on Caroline Found and the West High Volleyball team several years ago. They showed many “real life” clips at the end of the movie, and those REALLY gave me the tears and the goosebumps!